A communication process designed to reveal to a specific audience the significance of a historic / cultural / natural site or museum and the audience’s relationship to it a first-hand experience involving interaction with another person, a place, an object or an artefact. Live interpretation and museum theatre are just two, highly effective forms of interpretative technique. A broad term used to cover any live interaction between museum / site staff and visitors. 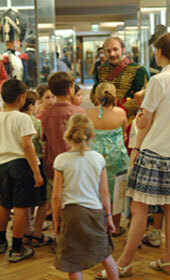 This includes many living history-type activities, ranging from non-costumed demonstrations of historical craft to storytelling and costumed first- and third-person interpretation, but is also used to cover activities such as guided tours, education workshops, theatre performances and demonstrations. A specific kind of interpretation that employs fictional activity to communicate ideas, facts and concepts. A museum-theatre performer assumes the role of a character (as a solo gallery character, an interpreter or as part of a play or scenario) in order to entertain and educate visitors. They take on the role of a particular character in a particular circumstance in order to help visitors appreciate and understand the story in hand and, through that, some aspect of the host museum or site. Where an interpreter assumes a particular role, often (but not always) in appropriate costume, either form the premise that he / she has moved forward through time to the present, or that his / her audience has moved backwards through time to his / her past. Where an interpreter dresses in appropriate costume and has a full knowledge of the life of a particular character or specific era, but does not assume that role (i.e. can speak authoritatively of the character’s life and times, but remains a 21st century person discussing the past). A very broad term used to describe historically authentic activities in an appropriate context, often an open air museum. 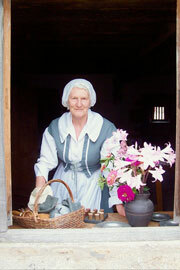 Interpreters engaged in living history may be in role (see First Person) or simply in costume (see Third Person). A detailed recreation (often by a large number of people) of a single short-term historical event (such as a battle, designed to attract a large number of spectators), where action, costume and combat often take precedence over the spoken word. Where the audience as well as the interpreter takes on a role or roles within a particular scenario or performance which supports the plot, which may or may not involve advance preparation and the wearing of appropriate costume. Where the interpreter focuses on relating a particular story rather than on wearing an authentic costume or playing a particular character. WHAT IS THE DIFFERENCE BETWEEN MUSEUM THEATRE AND LIVE INTERPRETATION? They are more similar than different! Both can be performance, script or scenario-based or completely spontaneous and improvised. The term “theatre” tends to be used by trained actors working in this field, often in dedicated performance spaces within museums and galleries (ie.. non-historic contexts). The term “live interpretation” tends to be used by those who come from a history or museology background and often takes place in historic contexts (eg. open air museums, historic houses). It is the quality and appropriateness of theatre or live interpretation (rather than any slight difference in approach) which counts. The aim of both is to communicate facts, concepts, and/or an historical period as effectively and memorably as possible. IS IT THE SAME AS LIVING HISTORY? Living history is often unstructured in terms of narrative, and focussed on past life skills such as crafts or ways of working. Living history tends to describe a context (recreated street, open air museum) as much as any activity (like theatre or live interpretation) which may happen there. IS IT THE SAME AS RE-ENACTMENT? In re-enactment the emphasis tends to be on visual impact at a distance. Live interpretation is more reliant on dialogue between interpreters or between interpreter and audience (see key definitions).Re-enactors are often hobbyists, who take part in larger scale re-enactments of battles or other costumed events as a leisure activity rather than as a profession.